Monster Camo™ is the innovator in Off-Road Hunting Gear. Created by Robert King, the original creator of King’s Camo™, Monster Camo was designed to break the mold and contest today&apos;s most popular camouflage trends. Monster Innovations, LLC combines the team&apos;s passion for motorsports with their passion for ultimate big game hunting. Monster Camo has been designed for a multitude of terrains, it’s adaptability and flexibility are its greatest assets. This Off-Road hunting camouflage features an incredibly unique design with color codes that blend into virtually any terrain. From high mountains, low deserts, and thick woodland areas, Monster Innovations, LLC has developed a camouflage that will keep you hidden while stalking that monster buck. Ever notice that green trim line in their hunting apparel? Monster Camo is designed to stand out, be bold, and be noticed (except by ungulates). Made for the serious hunter, their gear is "race ready" so you can kick your hunting game into 4-wheel drive. Ready to take a deeper dive? Learn more about the history, team, and camouflage technology behind Monster Innovations, LLC in this exclusive interview with their founder, Robert King. 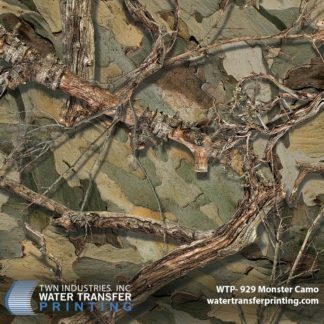 Also, get a behind-the-scenes look at our Water Transfer Printing process as we dip some gear in this innovative hunting camouflage.